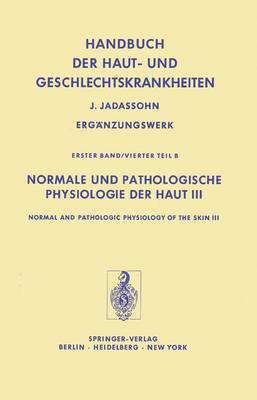 In this handbook the opportunity has been taken firstly to present the waterbalance in the horny layer and the sweat secretion process with particular emphasis on their relationship to the pharmacodynamical aspects of the micro- circulation and permeability of the skin. F. A. 1. THIELE was unable to witness the printing of his life-work concerning the water balance of skin, which he had compiled at the university in Nijmegen with J. W. H. MALI and G. 1. DE JONGH and D. A. REAY from Great Britain. Their contribution concentrates on evaluating the cooling function of the sweat glands with their heat-pipe system and on the physico-chemical effects of dermatological therapy and topically applied cosmetics. A certain amount of overlapping with Volume I/4A (E. SCHWARZ) could not be avoided, and yet the presentation by THIELE and co-workers considers different aspects. The pharmacodynamics of externally applied substances involved in microcirculation are related thematically also to percutaneous resorption. Function and morphology of pharmacodynamics in microcirculation are inseparable. Therefore the structural alterations of the blood vessels in reaction to foreign agents or as an adaptation to endogenous tissue hormone release have been examined electronmicroscopically by W. G. FORSSMANN and his team, and relay a distinct picture of the microcirculation in the area of skin reactiveness. The direct pharmacological aspects of the skin and the systemic effects on blood vessels and their permeability have been listed according to the latest research material.